Welcome to my blog. I'm Lisa, a born & raised NYer. I've been traveling since a very young age. To date, I have traveled to 44 US states, most of the Caribbean, Canada, Mexico, Israel (twice), Egypt, Ireland, Spain, Portugal & Gibraltar. Traveling is my passion, needless to say. I purchased an ownership in Disney's timeshare, Disney Vacation Club, at the age of 21. I grew up taking many trips to Disney World and even as an adult it's still my favorite vacation spot. Disney Vacation Club doesn't just guarantee you vacations to Disney World, it also includes all Disney properties, Disney cruises & over 300 other destinations throughout the world. I love being a DVC Member! In 2010 after much nagging from my family I finally decided to start a travel blog. I've always loved writing & I love to have the little memories most people forget from each vacation written down. A travel blog just made sense, although I'm not much of a self promoter-that's where the nagging family came in. Being the huge Seinfeld fan that I am the name of my blog came quite easy. I've been blogging my trips since 2010 & I love it. After quite the hiatus and missing out on sharing some fun trips, in 2017 I'm back! In 2011, Matt came into my life & 15 months later we were married. May 6, 2012. What a great day. Our wedding was a dream and was featured in Style Me Pretty & I was also interviewed for Westchester Magazine. Needless to say, what an exciting time it has been for Matt and I. The biggest thing Matt & I are known for is our love for baseball. One problem, he's a Yankee fan & I'm a diehard Mets fan. 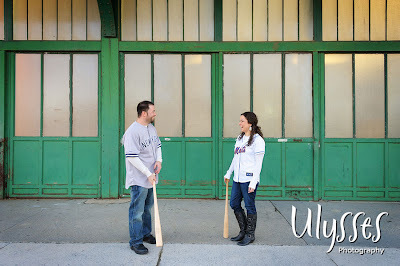 I always vowed I would NEVER marry a Yankee fan. I wanted to marry a Met fan or be a double threat & marry a Red Sox fan. Needless to say, never say never. As a former NY Mets season ticket holder, I take my Mets very seriously. It's the biggest love-hate relationship I will ever know, me & the Mets that is. Matt & I aren't sick of each other just yet. Matt does well for the most part. Usually he's not the stereotypical annoying Yankee fan, but he does have his jabs every once in a while. Those are the moments I CHOOSE to love my husband. Before getting married we did attend a couple Subway Series just to be sure we could handle it. So far so good, although, we haven't quite figured out how to handle raising our kids. This is the area it's really starting to affect us...and them. Poor things are definitely going to need counseling. Since getting married we live in Westchester County, NY, two doors down from my parents, who we travel with a lot. What a joy to have family so close. In October 2014, we welcomed our first child, Benjamin, aka. Benji, and 17 months later, on the last day of March 2016 we welcomed Vivian, a.k.a. Vivi, into our family. I am a stay at home mom & aunt since I also watch my nephew, Brayden, full time. Brayden is only 20 days older than Benjamin so it's like I have twin boys 40+ hours a week, plus the diva. Now you know how to pray for me. Matt works throughout NY & NJ, where he's originally from, in building automation. We have two dogs, Rocky, a 4.5lb Yorkie and Gemma a Golden Retriever. They're both girls even though Rocky is a "boy name"... trust me I know. Well, I hope you enjoy the blog & that you've enjoyed getting to know just a little bit about us. Don't be a stranger, leave some comments and most importantly, Let's go Mets!